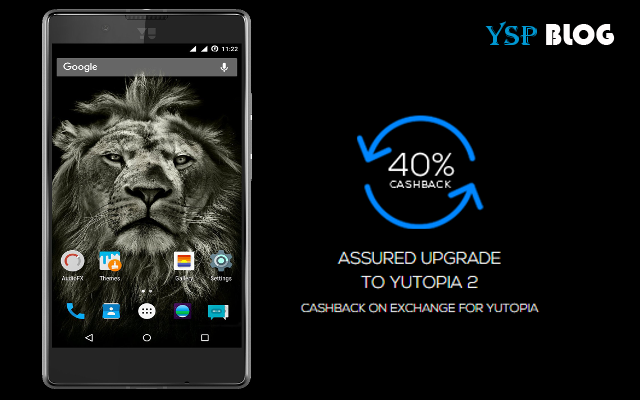 YU Yutopia was launched on 17th December for just ₹24,999 with a very impressive specifications and a list of offers for Yutopia buyers which included assured buyback program. If you're confused as to what it is this article will help in you understanding the details of the Yutopia device trade-in program. In very simple terms, assured upgrade will give you a chance to exchange your Yutopia with next year's Yutopia2 wherein you'll get 40% discount on new flagship model. This program will allow you to get a new device every year without paying the full amount. So if you're someone who wants use the latest mobile phone in the market, Yutopia buyback program will ensure that you've a new flagship every year. This blog is licensed under a Creative Commons Attribution v3.0 or any later vesrion.